Work is stressful these days - a lot of things going on, so I'm not even going to talk about it (sigh). Last week was one of those weeks you just want done, finished, finito. I was so happy when the weekend came, but Saturday was a soaker as hurricane Hanna dumped a lot of rain and wind in the area. I actually didn't mind the rain, as I curled on my couch and watched my Sandra Bullock favorite movies. In the afternoon, I was in high spirits as I collected my mail for the week. I received letters from friends and pen friends. I am so happy whenever I see cute and colorful letters in my mailbox. 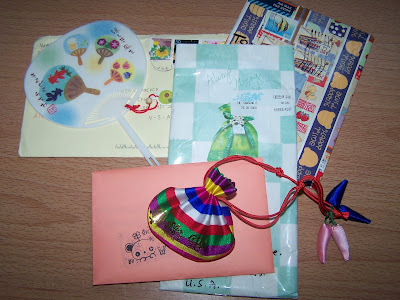 I also received really cute surprises in the mail - a miniature fan from Japan, and a "lucky pouch" from S. Korea. 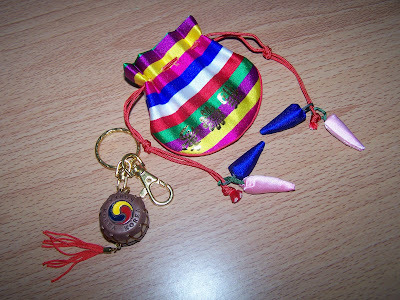 Inside the "lucky pouch," there was this traditional Korean drum key chain. I just think the pouch and key chain are so adorable. So while the wind howled and the rain poured, I sat by my desk and wrote letters to my friends. I wrote my heart out. Gosh, you still have pen friends? :) When I heard of pen friends I actually think of highschool. I used to have 'penpals' then. One of my best friends was a well-loved penpal. But we actually met first in a highschool convention. Coz there was no internet yet hence the snailmails. We were a ship ride away from each other. Hi Wits, I've been writing letters to penpals since sixth grade. Some of them I've been writing to for more than 20 years. Every time I get a letter, it really brightens my day. I love e-mails, but I love snailmails better. i love getting snail mail too. there's this undefinable feeling of being loved and remembered no? cuuuute! reminds me of my pen pal years. I used to correspond with a Japanese pen friend since 1995. Internet was not common then. Now that internet is common, we only write once a year! During christmas only, yaiks! ms firefly, in the past, i used to wait for a number of letters to accumulate then write back. suddenly, i feel like i could write a letter everyday. i'm not too sure what happened. it feels like i drank red bull or something =). caryn, oh yes, it is a lovely feeling to see your name on a colorful envelope with art and stickers and all. it is the feeling of being remembered and loved indeed. artemis, i agree, with the internet's ability to deliver e-mails so fast, we tend to take writing letters for granted. i don't know, but i am still much more inclined into writing real letters. to me, it's like a form of art. hi cheryle, yes, the pouch came from korea too. i think they're so cute. hay, anytime you need encouragement, i'm here =). oh, those are sweet and thoughtful gifts.. japanese and korean littke things are so adorable.. i love them! i always see them because we have lots of korean and japanese kids and they have such adorable things..
hi toni, next time you see those kids' cute stuffs, could you grab one for me...lol. just kidding. me too, i love cute and adorable things.